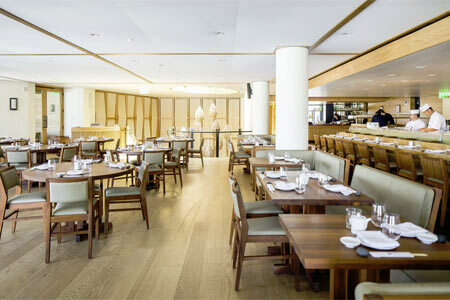 : The lone OC iteration of chef Nobu Matsuhisa’s worldwide chain of upscale sushi fusion joints may be the Newport Beachiest restaurant in Newport Beach. The two-story waterfront venue virtually drips opulence from its golden brown interior, and its intimate lighting and harbor-adjacent views are catnip to residents unafraid to flaunt their wealth. The see-and-be-seen crowd fill up the bottom floor to mingle over cocktails and explore the venue’s famous array of sushi, rolls, sashimi and skewers. Those seeking an even more refined experience can ascend the spiral staircase and settle into a couple hours of indulging in various cold and hot dishes. The former include the excellent monkfish liver pâté and the salmon nashi pear. Over on the latter side, you’ll find the wild mushroom salad, ocean trout with shiso serrano, and turf-based fare like the rib-eye with truffle butter sauce. If you’re new to the bourgeois, you can celebrate with a pricey serving of caviar and a bottle of aged saké or a high-end selection from the wine list. Desserts such as the peanut butter and jelly torte await at meal’s end.